When testing your Lync 2013 environment it sometimes happens that you cannot logon to your Lync server. 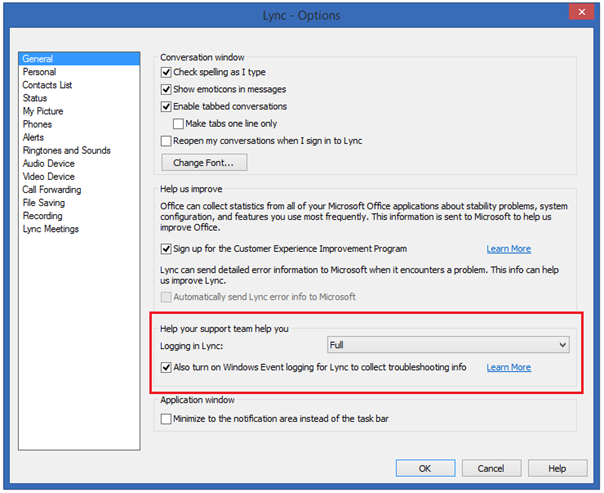 If this happens it can be useful to enable logging in your Lync 2013 client. In your Lync 2013 client, go to Tools en then to Options. In the General section set Logging in Lync to Full. The log files will be stored in C:\Users\Jaap\AppData\Local\Microsoft\Office\15.0\Lync\Tracing. In there you’ll find a file called Lync-UccApi-0.UccApilog which contains a wealth of troubleshooting information.